With the summer of '17 fast approaching, many Dons' fans with long memories are casting their minds back to one of the most memorable summers in the history of Aberdeen Football Club. In the summer of 1967 a party of Eddie Turnbull's Dons set sail for the USA to take part in the NASL's inaugural league season. They were going to represent the Federal Capital under the name of the Washington Whips and it was going to be an experience that none of those who took part would ever forget. There were fifteen players in the travelling party, in the company of trainer Davie Shaw. Eddie Turnbull was unable to travel initially so appointed Harry Melrose as his stand-in, a role that set Harry in good stead for his footballing future. The full travelling squad, away from home on a six-week adventure was: Davie Shaw (Trainer), Frank Munro, Willie Watt, Bobby Clark, Jim Storrie, Jens Petersen, Ally Shewan, Martin Buchan, Ian Taylor, Jim Whyte, Pat Wilson, Jimmy Smith, Dave Johnston, Harry Melrose (Captain), Jimmy Wilson, Tommy McMillan and Jim Hermiston. Eddie Turnbull followed on some time later but still manged to fit in a meeting with President Lyndon Baines Johnson, who was the most famous season ticket holder for the Whips. The tournament would see the Dons play a total of 14 matches, including three against Wolverhampton Wanderers. Every team came from either Europe or South America and took on a name representative of the cities that served as their home bases. The structure of the league was a little peculiar to Scottish fans, being made up of an Eastern and a Western Division, where every team played every other team once. A feature of the tournament was that players wore numbers on the front of the jerseys as well as on the backs, no doubt a twist aimed at helping an uneducated public to keep track of who was whom. The Washington Whips emerged as the winners of the Eastern competition and the LA Wolves took top place in the Western Division and they went forward to meet in a final, winner-takes-all, play-off at the Los Angeles Memorial Coliseum in front of a crowd of 17,824 spectators and watched by a TV audience of unknown proportions across the USA. The coverage by ATV was, to the ears of more knowledgeable football fans, somewhat eccentric and even comical at times, but the one statement that stood out was that the Final match was the "greatest soccer game ever seen, anywhere." Games don't always live up to such billing, but this one really was a belter, packed with goals and incidents that would make a modern day referee weep. The Whips had to play most of the match with only 10 men after Jimmy Smith was sent off for a "misdemeanour" but it failed to upset them and they gave as good as they got throughout the ninety minutes. At full-time the score was level at four all and the match went into extra time, at the end of which the scores were still level - at five each, and so to the innovative "Golden Goal" period, or next goal the winner if you were so inclined. Sadly, for the Whips, that goal went to Wolves when a cruel twist saw Ally Shewan put through his own goal, but take nothing away from the Reds, they had helped put on a truly remarkable game and despite the rough play and fisticuffs that were a feature of the match, the two sets of players were all pals at the end and shared the lap of honour. Now, to celebrate the Golden Jubilee of a wonderful adventure, a special print has been produced in a joint venture between the Club and its Youth Academy, along with the AFC Heritage Trust. The original painting has been created by artist Stewart Beckett well known for his many sporting artworks and a print limited to 350 numbered copies is being made available through the Club Shop. 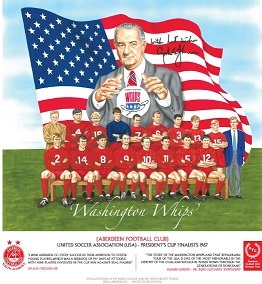 Many of the Whips squad have reunited to sign the first 150 copies of the print, demonstrating, not for the first time the strength of their feeling for the Dons and their former comrades. Launching on Thursday 9th June, the print offers a great chance to help raise funds for Youth Development, whilst at the same time celebrating a great event in the Club's history. In parallel to the prints, numbered copies of the Artist's Proofs will also be available.